I’ve always been fascinated with different designs of jewelries even if it’s just a simple necklace through rings. Any kind of blings has been always an eye-catcher for me. I suppose it’s due to my younger experiences, I’ve been sharing how my mother invested most of their money towards real jewelries, very expensive ones that needs to be guarded whenever you decide to wear it in an occasion. I’ve always been mesmerized whenever my mother showed us her charm collections. Of course, we have our likelihood too sometimes and yes! We need to guarantee that by the end of the affair, we have everything back to her. I have a superb prospect to work that would give me an additional collection to my fashionable jewelries. Unlike my mother, I can’t afford to invest my money towards expensive jewelries; however, that would not stop me from owning a trendy one. Something I can show off in special occasion without getting paranoid because of how luxurious they are. Where did I find one? Actually Majestical Jewelry found me, they’ve noticed my passion with jewelries and how I adore every single one of them. I acknowledged a very pleasant handmade “Floral necklace sets” from a high fashion online Majestical Jewelry in the mail one day. With a retail price of $55.00, their price is only $28.00. I keyed up to see how attractive it is, something I can wear during a special occasion. I love the flowery set; a stunning statement piece, which I find, would be a captivating new style to include in your outfit. The necklace has 24" approx. Length + 3" extender. They have fast shipping and ships on the same day you order. It is quick, easy, and free when you have returned or exchange the item. Majestical Jewelry has a great collection of Fashionable Jewelries you might want to visit the website @ http://www.majestical.com. They are offering a promotional code for $15 off orders $55 or more. Please apply 15DOLLARSOFF code at the checkout. that looks great on you, Novs. That is an attractive piece of jewelry and you certainly wear it well. 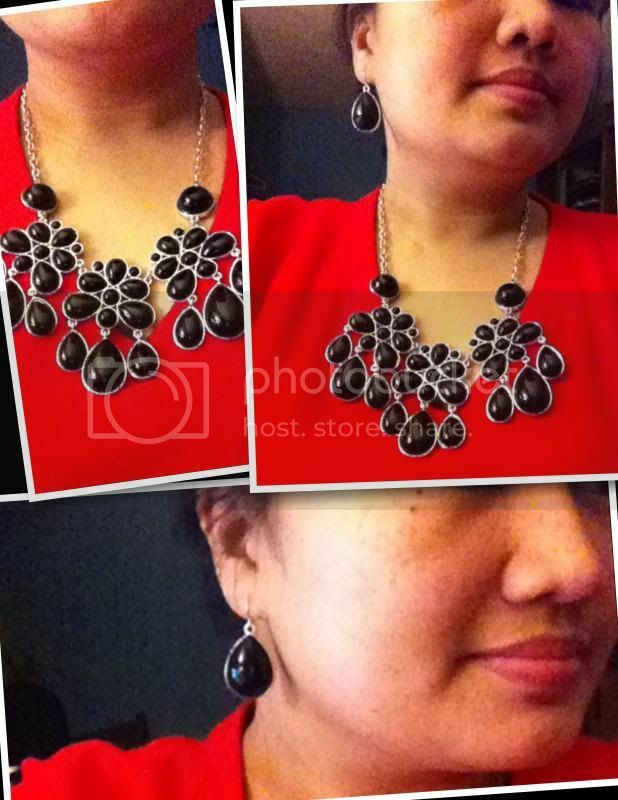 Love that necklace and earrings. Perfect accessories for your red dress. THat's pretty although I am not into big blings like this. I like simple ones. I tried to apply before for a review at Tomoson but I didn't received any items. Anyways you really look like a model on that necklace.